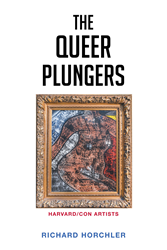 Richard Horchler’s new book “The Queer Plungers” is the captivating tale of four wayward Harvard students who explore con-artistry. Recent release “The Queer Plungers” from Page Publishing author Richard Horchler is the compelling story of four Harvard students who scheme up a deception when they strike up a friendship with an unlikely partner in crime-their young college professor. Richard Horchler, a resident of Scottsdale, Arizona, has completed his new book “The Queer Plungers”: a captivating tale of four wayward protagonists who embark on an unlikely adventure. Like many young college students, Poppy and her friends are restless and unsure of what they want to do in the future. As juniors at this elite college, they are close to facing the reality of going out into the world to forge their career path. These four protagonists have worldly, yet somewhat cynical views of everything around them, including the exclusive school they attend. When striking up a relationship with a professor, the four embark in a game of deception. Readers who wish to experience this electrifying work can purchase“The Queer Plungers” at bookstores everywhere, or online at the Apple iTunes store, Amazon, Kobo, Google Play or Barnes and Noble.